Wessler interviewed Michele Meyer with the Indiana Department of Transportation (INDOT) about Storm Water Quality Control Plans (SWQCPs), which are required for contractors to prepare and implement for INDOT construction projects. The requirement became effective in 2016. Thank you to Michele for taking time to answer our questions. What is your role at INDOT? I am the Storm Water Specialist for Vincennes, Crawfordville and Seymour Districts. I review Rule 5/SWPPPs, conduct storm water compliance inspections and serve as a technical advisor for storm water, sediment and erosion control. I am also the MS4 coordinator for INDOT, which keeps me very busy managing our commitments as part of the Rule 13 permit. I also conduct Storm Water Management Trainings as well as other trainings required as part of the Rule 13 permit. INDOT is the only entity in the state that is allowed to submit an incomplete Rule 5/SWPPP. This is due to the fact that INDOT has not hired a contractor at the time of the Rule 5/SWPPP submittal. INDOT has required that contractors submit the missing information at least 14 days before the start of construction. After Federal Highway Administration audits, it was confirmed that for most of our INDOT projects the contractor was failing to submit the required information. To improve compliance in this area INDOT now requires that the contractor not only submit this missing information but also provide a Storm Water Quality Control Plan produced by a professional engineer who is a Certified Professional in Erosion and Sediment Control (CEPSC). This SWQCP creates a situation where the contractor has more buy in into the whole permitting process. 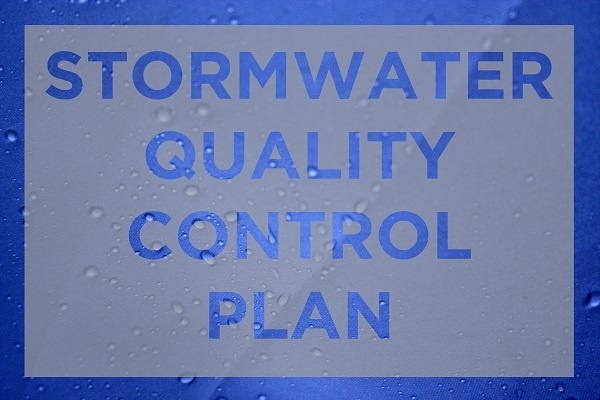 He or she has the opportunity to improve the original Storm Water Management plan provided in the Rule 5/SWPPP submittal, provide sequencing and phasing, and constructability. How is the SWQCP different from the SWPPP? The SWQCP is part of the SWPPP, the missing pieces that the contractor must provide. These items - such as staging areas, construction entrances, etc. - cannot always be located before a contractor is hired. The exact sequencing and phasing of the Storm Water Management was not included in the original SWPPP. There is nothing in the SWQCP that was not a requirement before - it is just that INDOT is now requiring that it be developed by a professional engineer with a CPESC. What are the required credentials for plan preparers? The Contractor’s Storm Water Quality Control Plan, as per INDOT RSP 205-R-636, must be prepared by a professional engineer and hold a CPESC or a CPESC in training. What do you want plan preparers to know about preparing the SWQCP? Designers can find everything they need to know about preparing the SWQCP in RSP 205-R636 and ITM 803. What do you want contractors to know about implementing their SWQCP? Everything a contractor needs to know about developing and implementing their SWQCP is in INDOT RSP 205-R-636. Trainings have been conducted all over the state for the past few years for both contractors and designers. Another big change in our new RSP is level determinations and “trained individual” credentials. All INDOT jobs with soil disturbance will be determined to be a Level I or Level II job. For Level I jobs the “trained individual” or the inspector for Storm Water Weeklies (weekly inspections) and post rain event must have attended and completed the INDOT Construction Storm Water Management training. The training, which includes a test, is valid for 3 years. Our first round of trainings, conducted in 2014, will require those contractors to renew their training in 2017. For Level II jobs, the “trained individual” must attend and complete the INDOT Construction Storm Water Management training as well as hold a: CESSWI, CESSWI-in training, CPESC, CPESC-in training or a CISEC. Tell me about the new INDOT Concrete Washout Specs? Due to chronic non-compliance with Concrete Waste Water Washouts, INDOT is now prohibiting straw bale washouts on all INDOT jobs starting with March 1, 2017 lettings. The contractor will also have to supply a concrete waste water plan as part of the SWQCP. In the plan, the contractor will have to supply to INDOT an estimation of the amount (in gallons) of concrete waste water that will be generated on the job site. The plan must include a description of the containment, including capacity, free board, maintenance and removal procedures. An emergency washout must also be on site in case of a washout failure or leakage. These new specs will be included in the RSP 205-R-636, which is being revised. For more information and to visit the INDOT Storm Water webpage, click here.